Having a combined Cholesterol and Lipids Test is one of the most common ways to assess your overall heart health. High LDL-cholesterol and triglycerides have been linked to a number of diseases, including heart attack, stroke, peripheral artery disease and atherosclerosis, high blood pressure (hypertension), and type II diabetes. Controlling your blood cholesterol levels can be key to reducing your risk for these disorders. 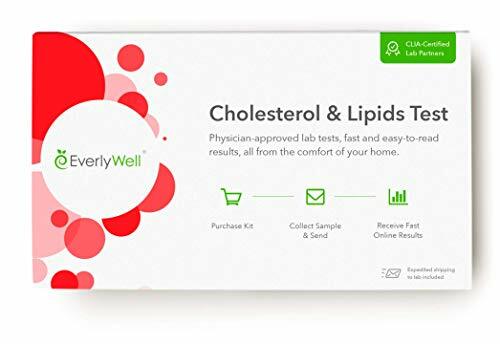 This test evaluates the four key components of a cholesterol test: total cholesterol, high density lipoprotein (HDL), low density lipoprotein (LDL), and triglycerides. Your results will contain your personal levels of these markers and whether they fall within a low, normal, or high range. Lab testing made easy. Complete your sample from home and receive secure online results within days. This is NOT an at-home monitoring device. Measures Direct LDL (bad cholesterol), HDL (good cholesterol), Total Cholesterol and Triglycerides. Quick + easy sample collection - only a few drops of blood. We provide easy-to-follow instructions. If you have any questions about this product by Everly Well, contact us by completing and submitting the form below. If you are looking for a specif part number, please include it with your message.